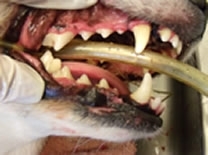 Dental disease is a major cause of discomfort and illness in pets. Often the owner has noticed that the animal does not like to eat dry food and/or has "bad breath." 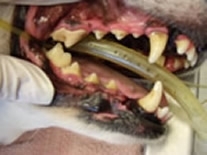 We hear again and again that pets with severe dental disease act much happier after a dental cleaning. Our staff will be happy to suggest tips to reduce tartar and plaque build up that leads to tooth and bone loss. For more advanced cases, ultrasonic cleaning, polishing and surgical extractions are also available.